2 What is the UN? 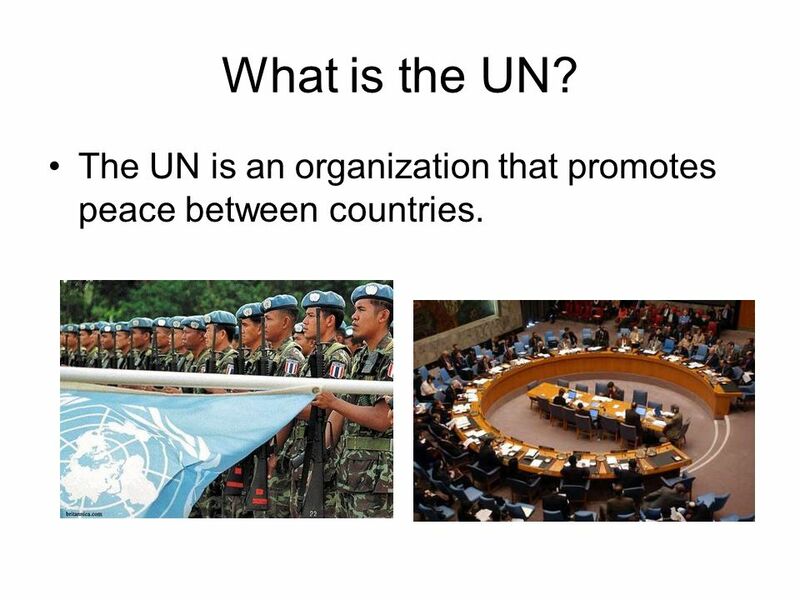 The UN is an organization that promotes peace between countries. 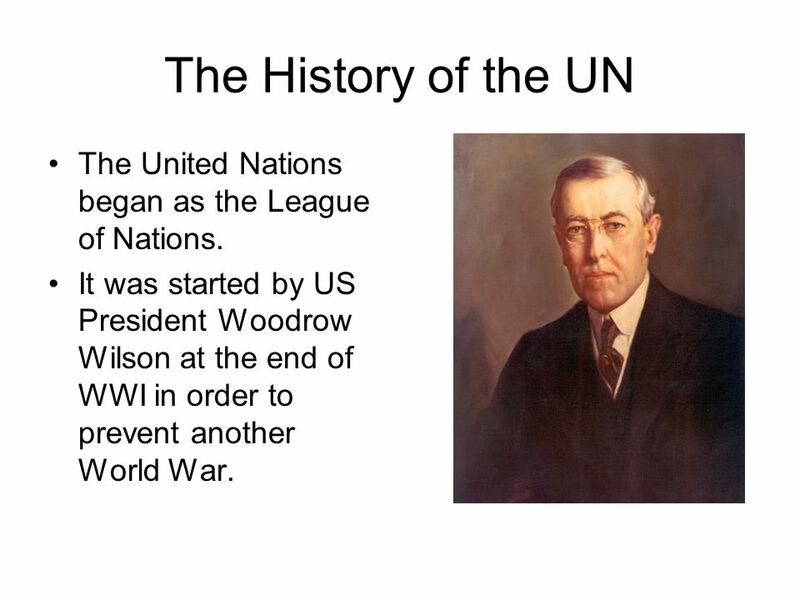 3 The History of the UN The United Nations began as the League of Nations. 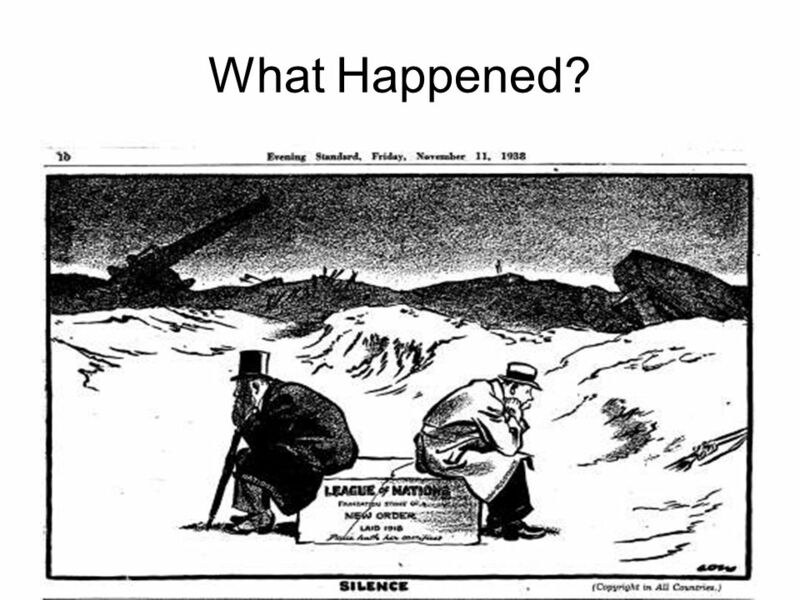 It was started by US President Woodrow Wilson at the end of WWI in order to prevent another World War. 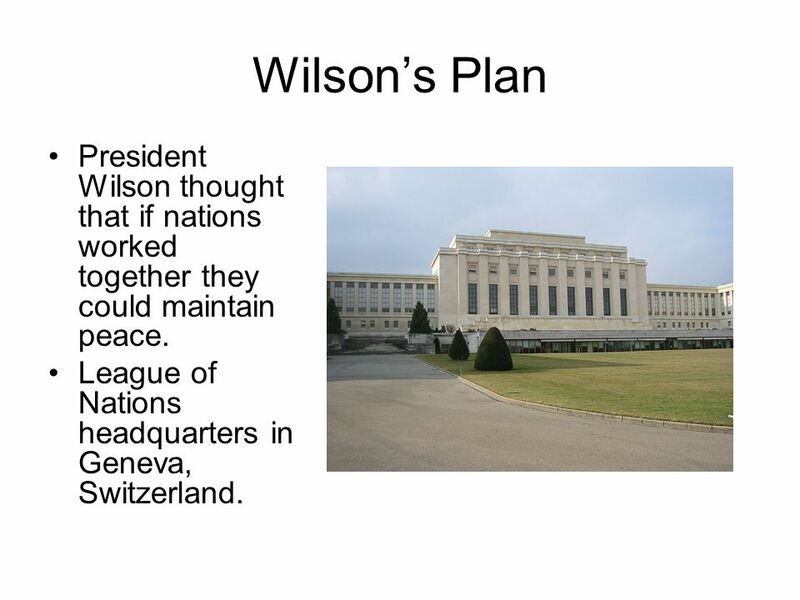 4 Wilson’s Plan President Wilson thought that if nations worked together they could maintain peace. 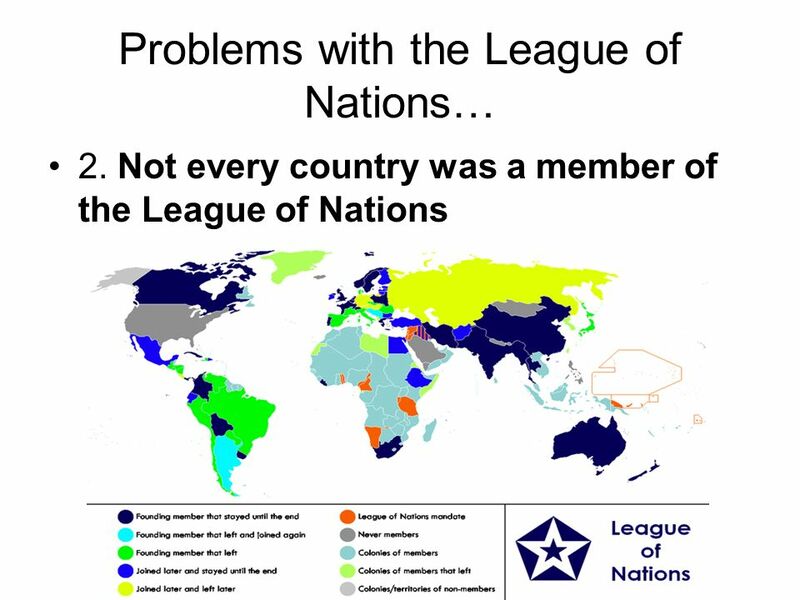 League of Nations headquarters in Geneva, Switzerland. 1. The League required a unanimous vote for decisions to be made. Have you ever tried to get more than two people to agree on where to go for dinner, let alone really important stuff!!!!! 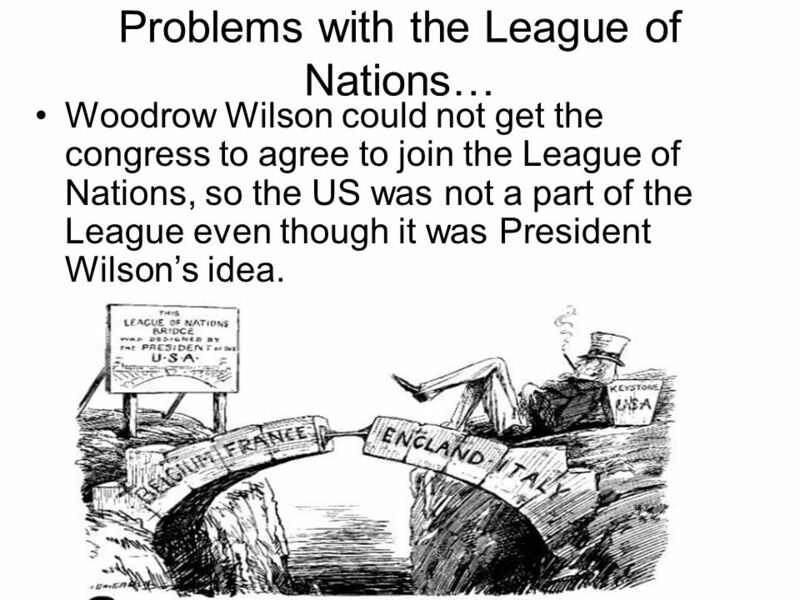 Woodrow Wilson could not get the congress to agree to join the League of Nations, so the US was not a part of the League even though it was President Wilson’s idea. There was no army to enforce decisions. 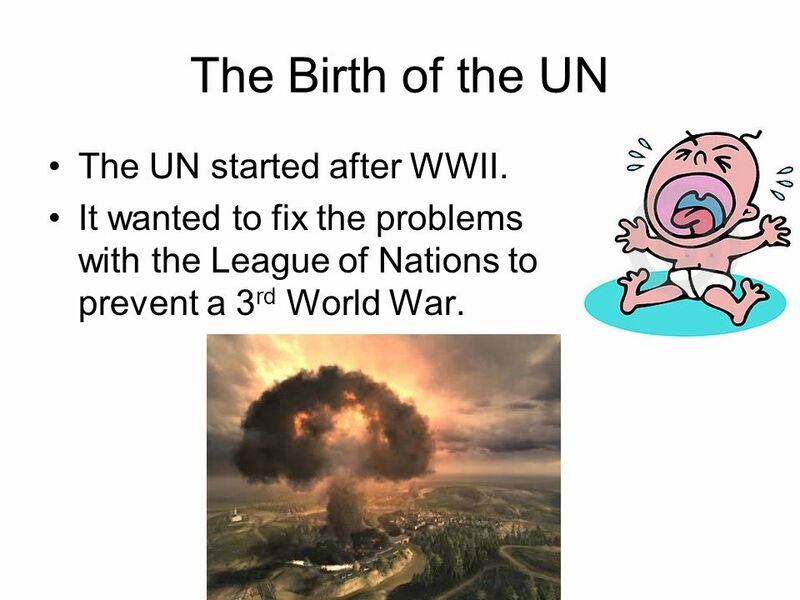 11 The Birth of the UN The UN started after WWII. 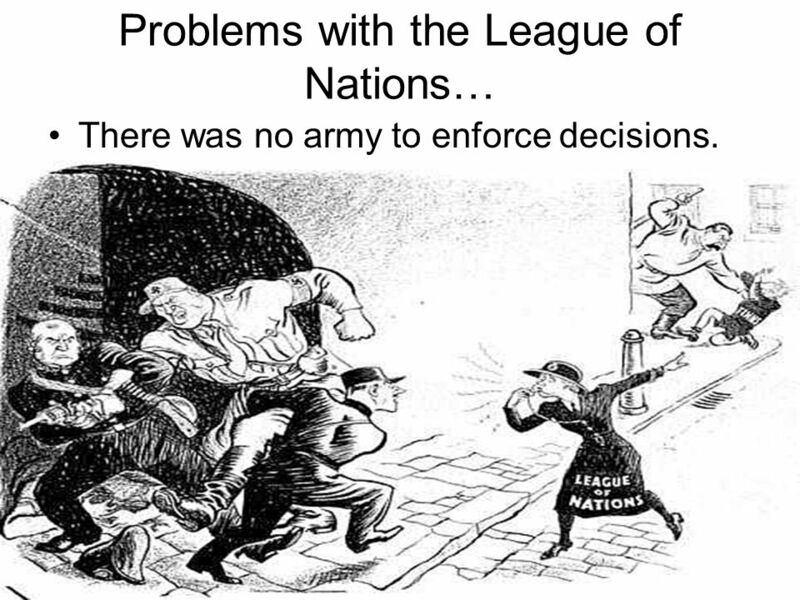 It wanted to fix the problems with the League of Nations to prevent a 3rd World War. 14 The General Assembly The General Assembly makes laws. 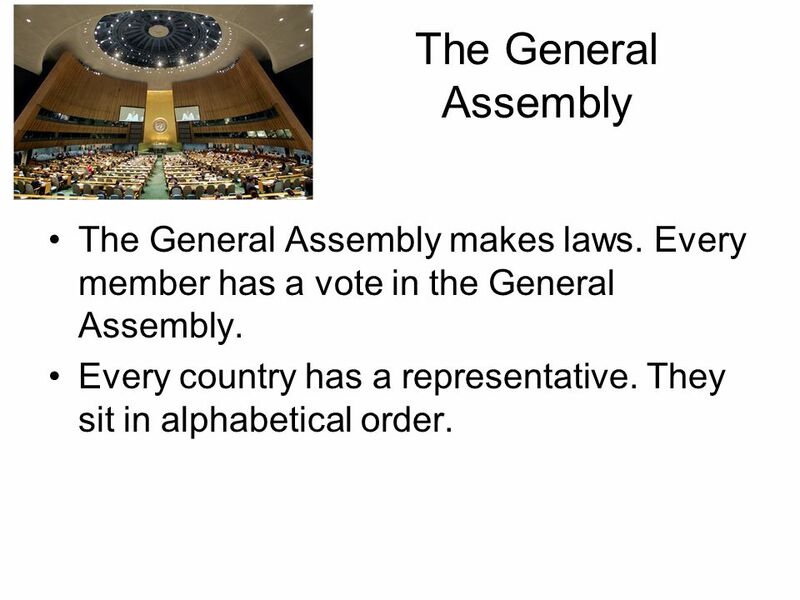 Every member has a vote in the General Assembly. Every country has a representative. They sit in alphabetical order. 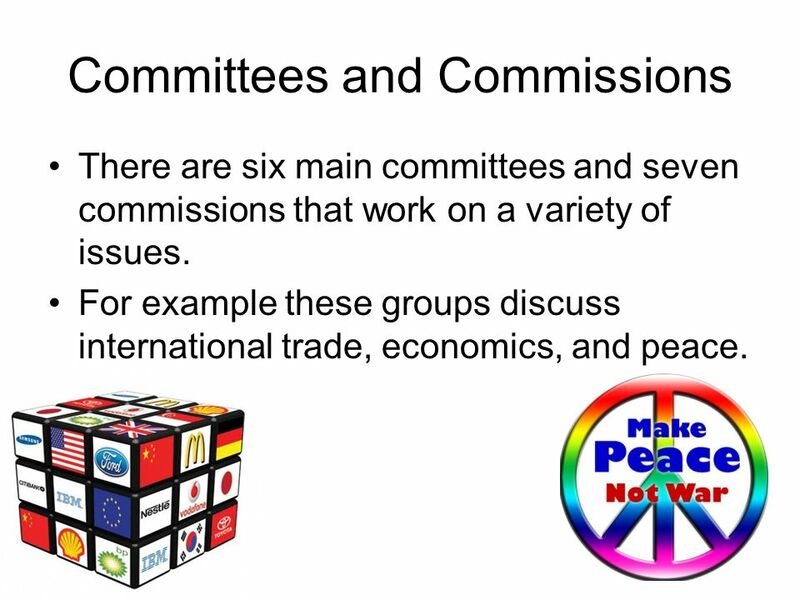 There are six main committees and seven commissions that work on a variety of issues. For example these groups discuss international trade, economics, and peace. 17 Security Council The Security Council tries to maintain peace. There are 5 permanent members and 10 non-permanent members. 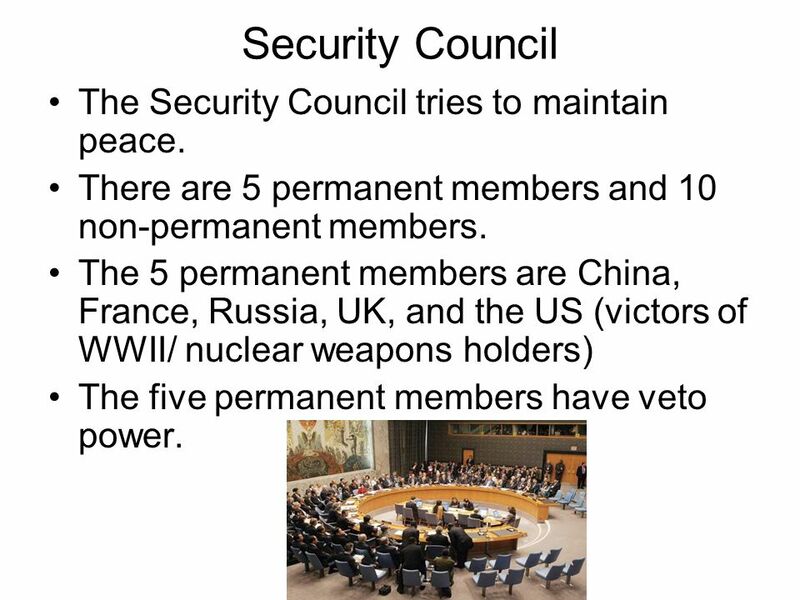 The 5 permanent members are China, France, Russia, UK, and the US (victors of WWII/ nuclear weapons holders) The five permanent members have veto power. 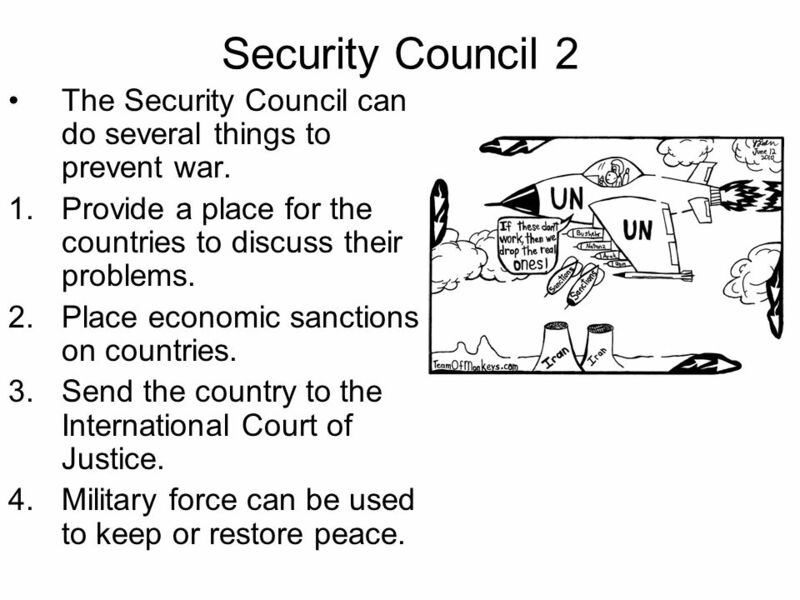 18 Security Council 2 The Security Council can do several things to prevent war. Provide a place for the countries to discuss their problems. Place economic sanctions on countries. 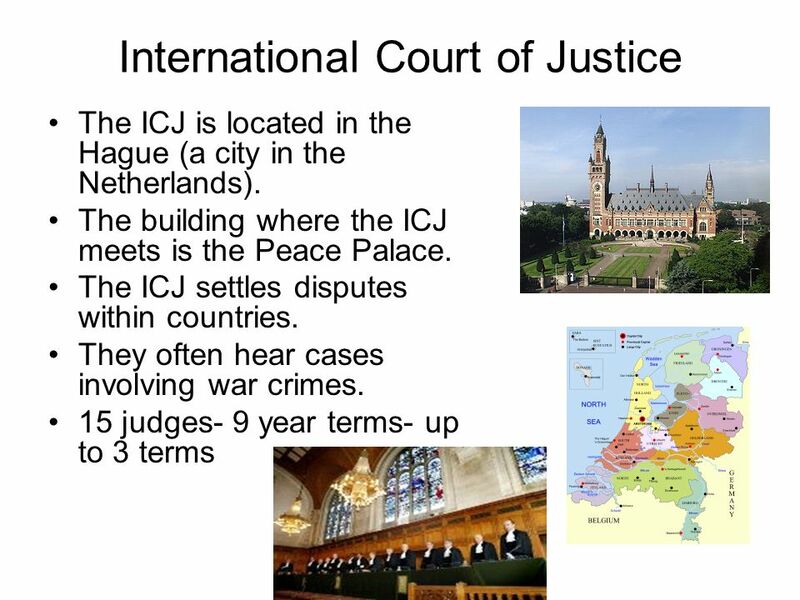 Send the country to the International Court of Justice. Military force can be used to keep or restore peace. It is difficult to get the 5 permanent members to agree on anything. Not all countries are members. 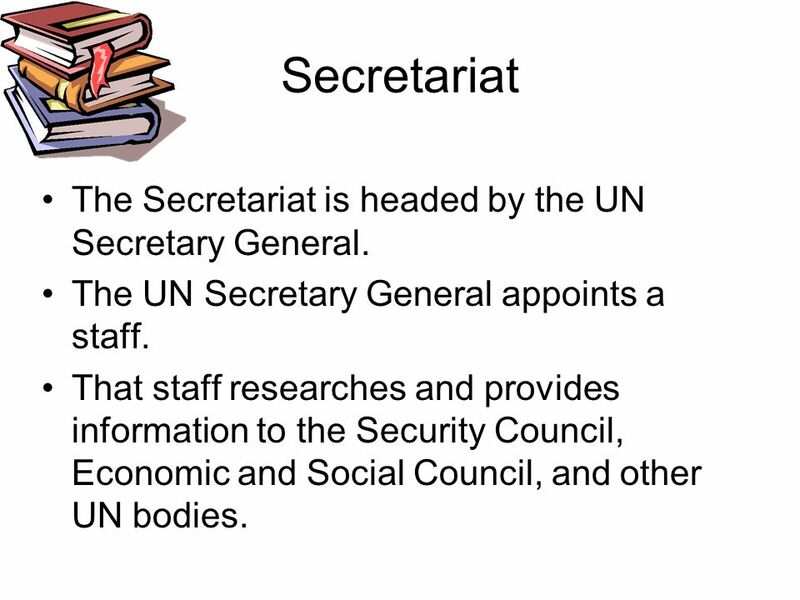 20 Secretariat The Secretariat is headed by the UN Secretary General. The UN Secretary General appoints a staff. That staff researches and provides information to the Security Council, Economic and Social Council, and other UN bodies. 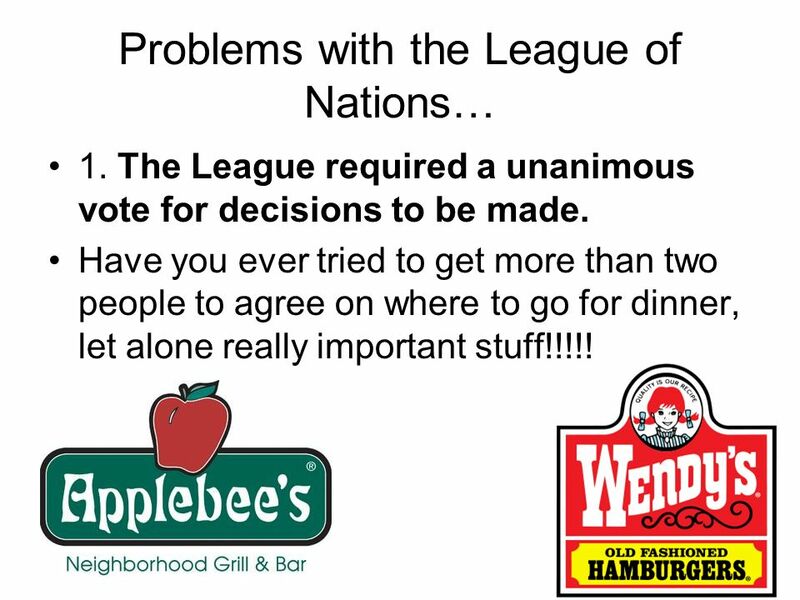 The decision making in the UN. 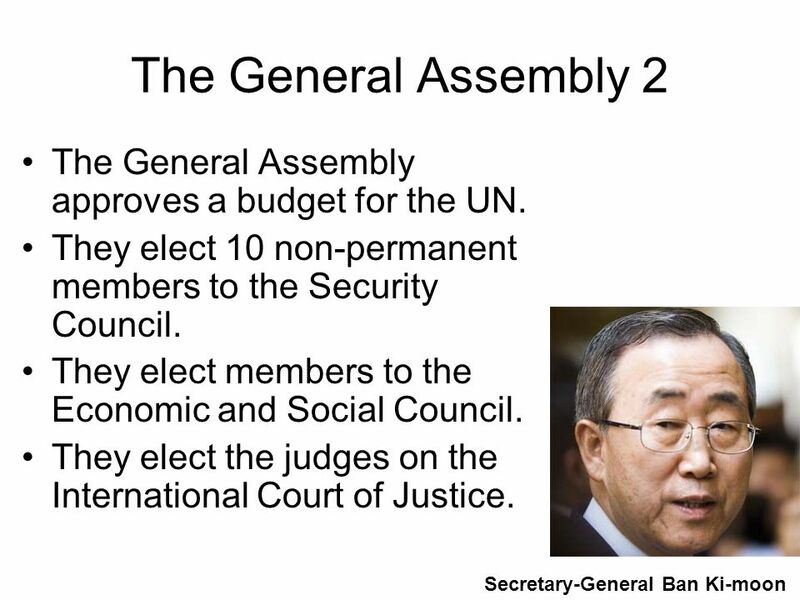 The General Assembly Security Council International Court of Justice Economic and Social Council Secretariat Trusteeship. 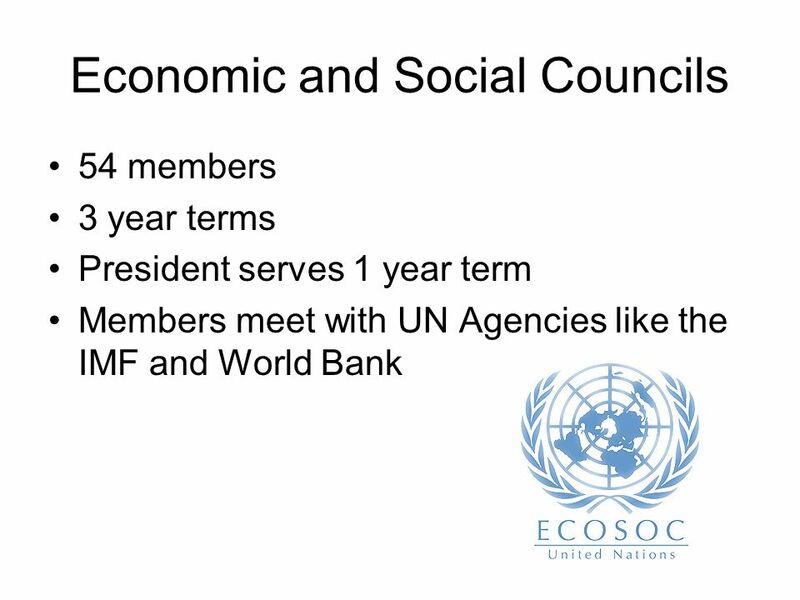 THE UNITED NATIONS October, THIS PRESENTATION INCLUDES: Introduction to the UN Main parts of the UN General Assembly Security Council Economic and. The United Nations Keeping peace throughout the world. Structure and Aims of the UN Sukrit, Han Yang, Yi xiang 401. 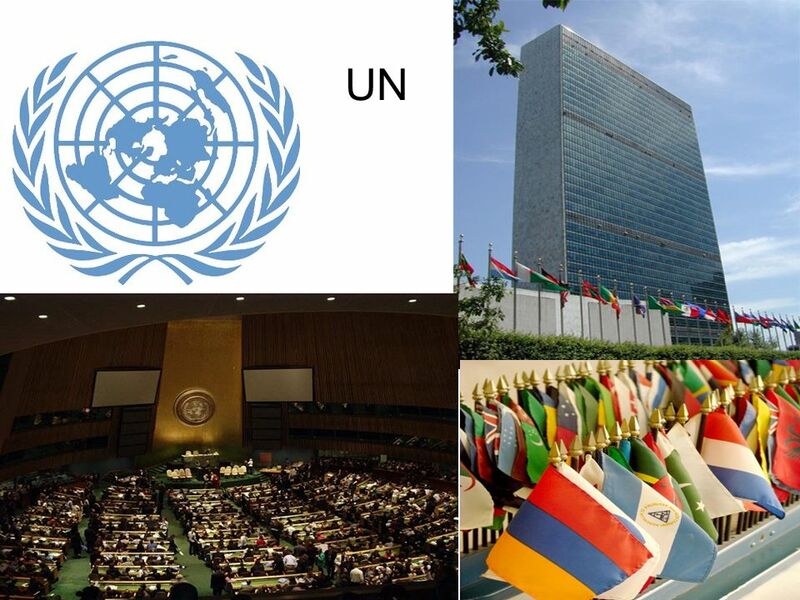 THE UNITED NATIONS ORGANISATION Aims and organization. The United Nations: It’s Your World! 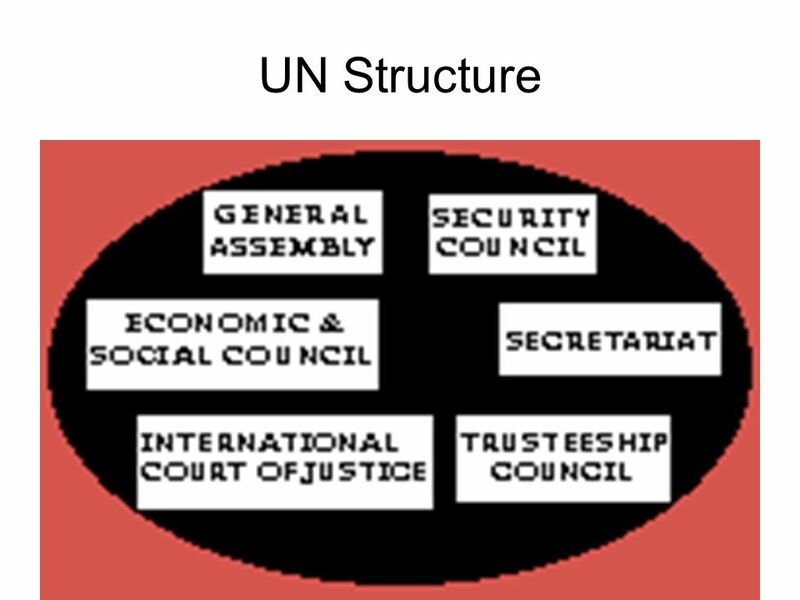 United Nations Aims and Structures 1965 Successor of LON. 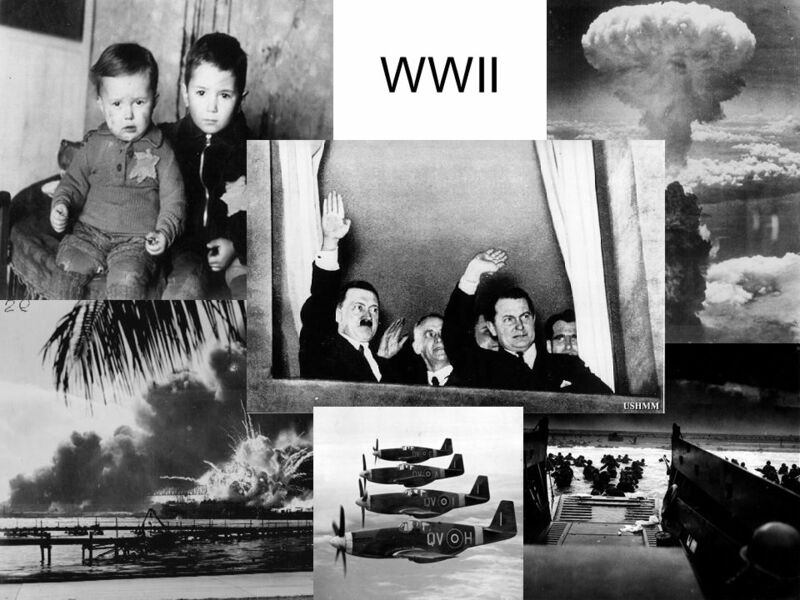 The Creation of the United Nations And the start of the Cold War.  THE UNITED NATIONS Global Classrooms IES San Juan Bautista. “A Love-Hate Affair” 1.What has been the relationship between Bush and the U.N.? What is the reason for this? 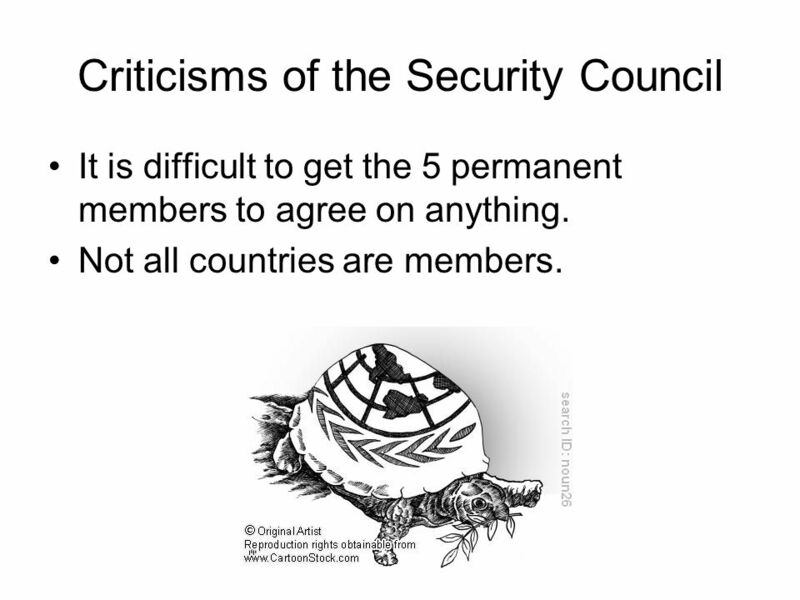 2.List 3 criticisms of the U.N. 3.Who pays. Lesson 5. Objectives  Review history behind creation of UN.  Identify goals of the UN.  Examine structure and function of UN organs.  Discuss role. The United Nations. 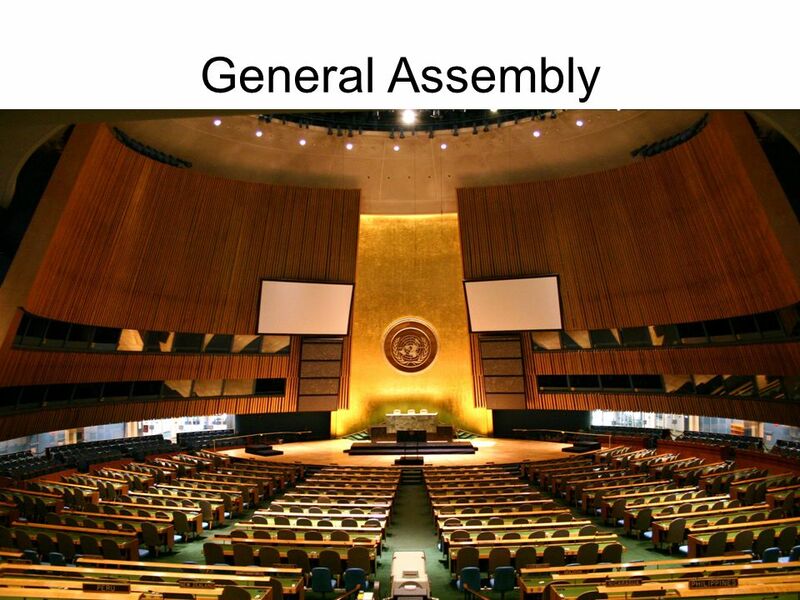 What is the United Nations? An International Organization Facilitates cooperation in: – International Law – International Security.